There is nothing better than being able to bake your own bread, getting it from the oven fresh, and putting it on the table at the time you want. 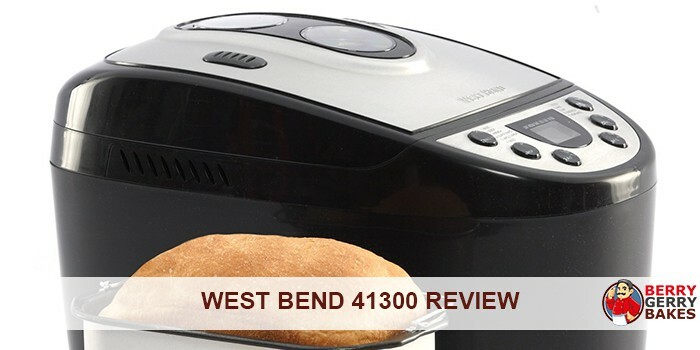 The West Bend 41300 Hi-Rise Electronic Dual-Blade Breadmaker provides an excellent bread making experience. Making your own bread means that you can decide exactly what you want to bake. This West Bend bread maker is flexible and easy to use, even for novice bakers. Making homemade bread with the West Bend 41300 is quite straight-forward from the start. You simply need to follow the recipe book that comes with the bread maker. The West Bend 41300 machine will take over and do the rest. The West Ben 41300 bread machine offers 3 crust options: light, medium or crusty baking. Apart from this, you can choose four different horizontal loaf sizes, from 1-pound up to 2.5-pounds. The bread maker also has a series of preset functions that will help you to cook bread, tasty French sticks, wholesome whole wheat and more. You can use the super rapid mode to cook a loaf quickly. 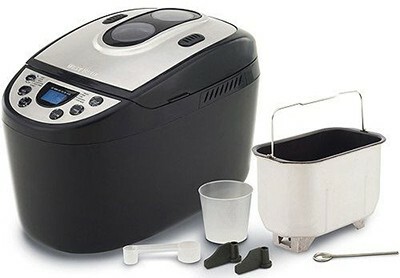 With this bread maker, you can knead dough and bake cakes, jam sandwich or a delicious chocolate cake. You can use the inbuilt delay timer to preset the baking oven to delay the start of the baking up to 12 hours and 58 minutes. This feature is handy if you wish to wake up to the smell of fresh bread wafting around you. The West Bend machine has two blades that make the dough rise higher when you are using yeast. There is also a large glass viewing window through which you to check the baking progress without interrupting it by raising the lid of the bread maker. The West Bend Breadmaker has a powerful motor and bakes delicious bread every time. This bread maker’s motor that can handle the heavy dough kneading without a problem. However, it will take quite some time before you can add dried fruits or raisins to your bread or cakes. Despite this, the resulting bread or baked goods are not inferior to those other bread makers that allow you to put these ingredients in sooner. 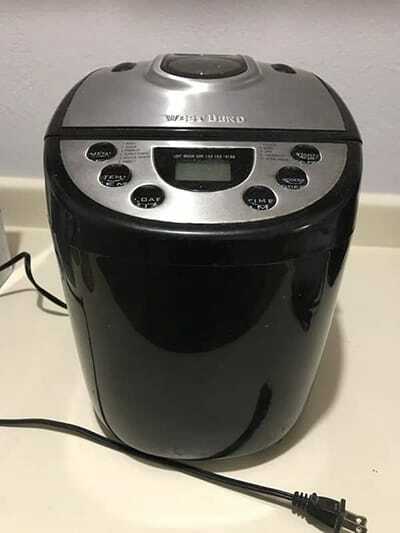 The West Bend 41300 bread maker has its quirks. For example, it does not alert you about the next phase of the baking process with audible beeps. Therefore, you will need, particularly in the early stages of using it, to be present in the kitchen to closely monitor the baking process. Moreover, the manual lacks information on how long it will take for each part of the baking process to be completed. Still, the West Bend 41300 bakes excellent bread. While different from other bread makers, understanding how the West Bend 41300 Hi-Rise Electronic Dual-Blade Breadmaker works is worth your while. The West Bend 41300 is no longer manufactured. Instead, it has been replaced by the West Bend 47413, which is faster, quieter and better. While you can still buy the 413000 on Amazon, we don’t recommend doing so. Not many sellers sell the bread machine and even if you get it, finding replacement parts can be a nightmare since the manufacturer is no longer supporting it.